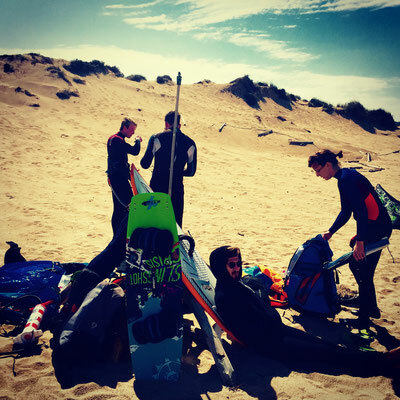 Camps - Benvenuti su surfstar! 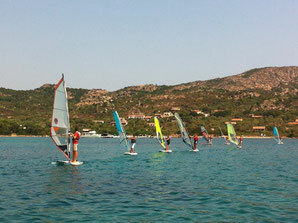 What makes SurfStar unique is its innovative windsurf summer campus. 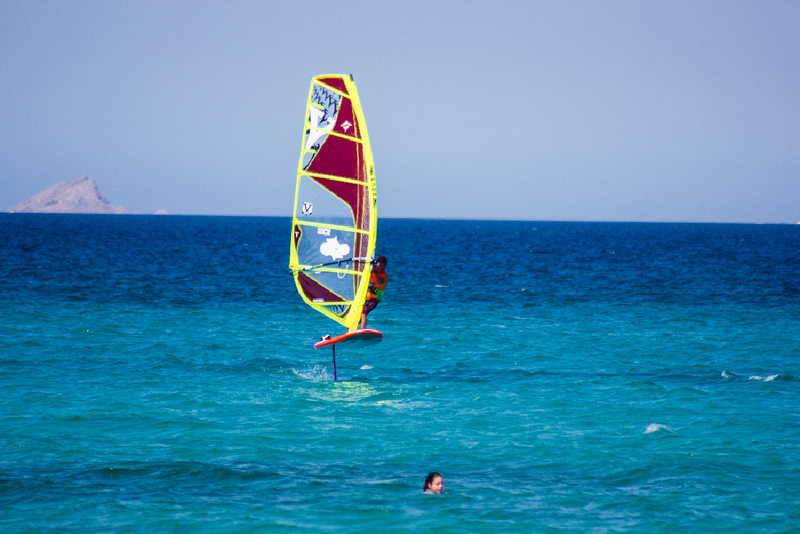 Our windsurf Camp consists of a one week stay in our Surf House at Porto Pollo. The package includes airport transfers, meals, accommodation ,course and materials. In small groups you will have from morning to night, both practical and theoretical instruction. 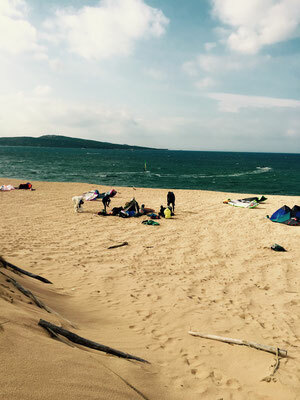 In the evening you can expect beach parties, barbecue and get-togethers. 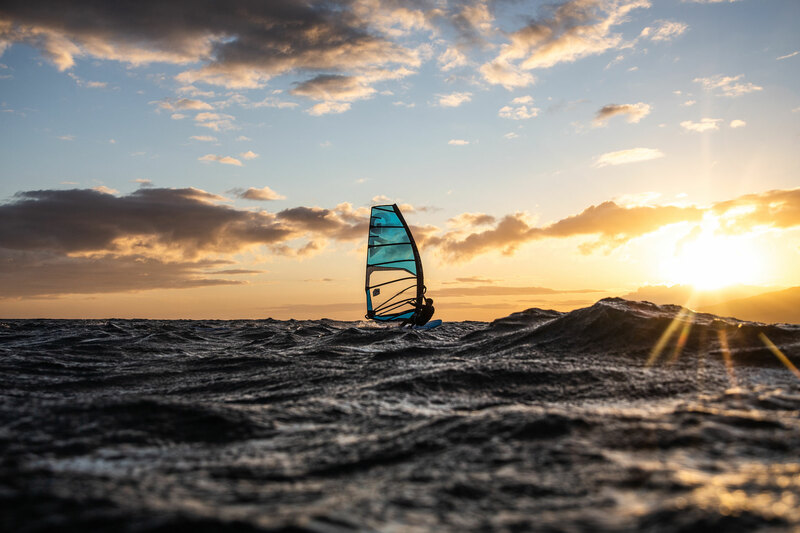 If you believe that windsurfing is a sport only for others and think about not being able to ever stay on top of a surfboard, then this is the right course for you. 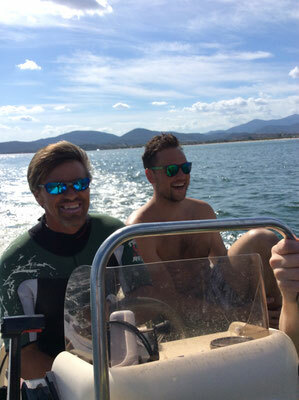 Theoretical hours, tests on the simulator and practice in the water with gradually increasing difficulty in combination with entertaining exercises on easy-to-use equipment will enable you to surf out at moderate wind speeds at the end of the course. If you have reached this point, it is clear that you enjoy surfing! And off we go with the first emotions of gliding. 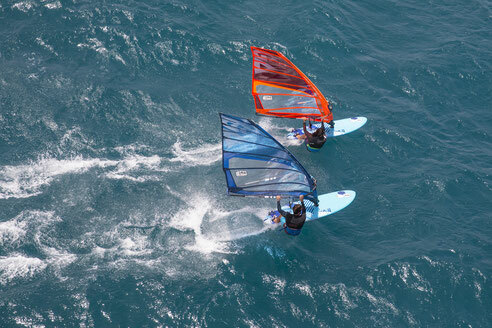 In moderate to strong winds you will be able to perfect the basic maneuvers. The aim will be to explore the water level and to find the right body position using straps and harness at higher speeds. 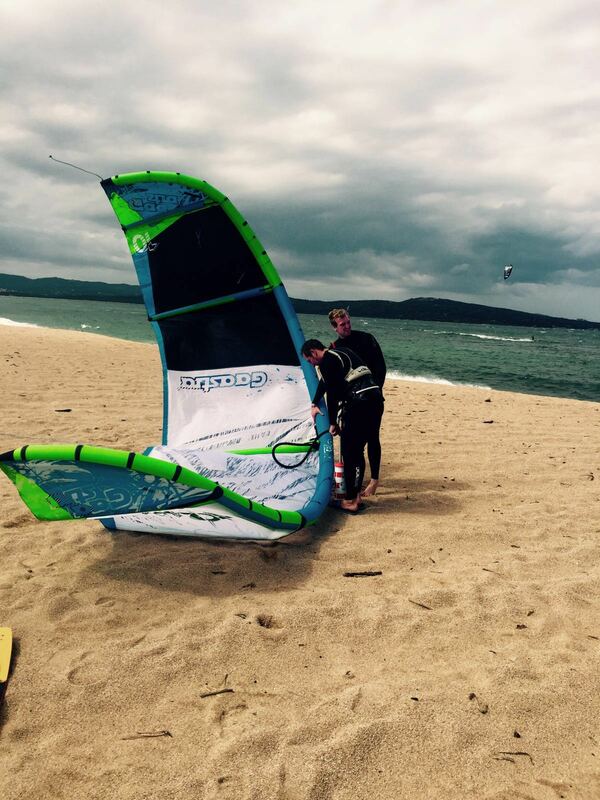 From this moment on you will be a true ‘windsurfer’, and the fun on the board will know no bounds. 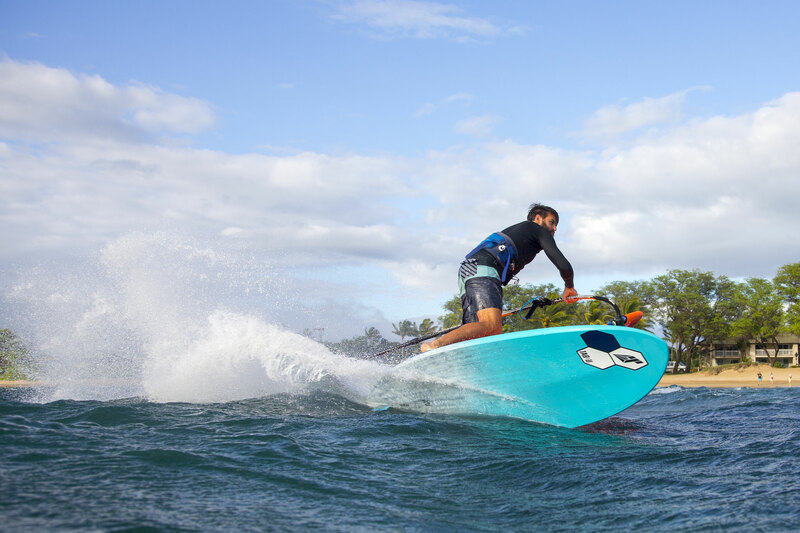 Once the keel disappears and you start taking it seriously, then you enter the world of ‘Funboards’ with ‘freeride’ boards! In this third step of your formation, you can study in more depth some of the topics already mentioned in the previous course and experience a new type of board, which is lighter, more maneuverable and agile! 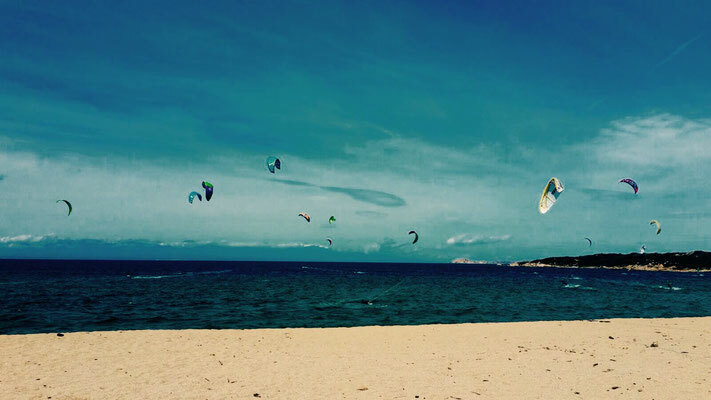 Let's SURF together and enjoy LA DOLCE VITA! Feel like summer during Easter or in fall? During our kite and windsurf camps in the low season you can expect summer temperatures, wind, empty beaches and beautiful bays. We will accommodate you into our spacious Surf House with 4-6 person bed rooms, or in separate apartments. Each night you will be served meals from the authentic Italian cuisine! Do you have your own material, don’t need a course or want a private stay with your family or friends? Reserve your individual camp. We offer a wide variety of options! Just write us an email! 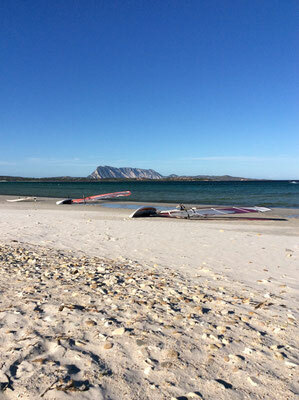 Sardinia, in spring and autumn, offers perfect conditions; twenty theses, excellent weather and semi-desert spots, are the ideal conditions for those with a more competitive spirit looking for the right spot to train in order to increase their competitive performances or for those who want to learn more about the race techniques, without having to take a plane or move to exotic places! These are the main characteristics with which, the SurfStar Academy organizes clinics for each discipline, supported, as well as by its staff, also by the collaboration of professional athletes and coaches. At sea and on land, you will always find the right atmosphere, from the technical planning of the day up to the moments to be shared together in front of a typical dinner or an aperitif outdoors. These clinics are aimed at a targeted target, composed of those who want to deepen their technical knowledge or refine the navigation in view of competitions or simply be the fastest with friends. 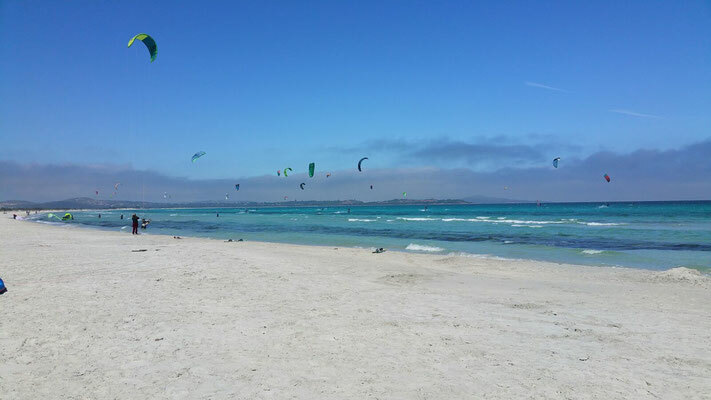 It consists of a holiday lasting a minimum of one week in San Teodoro. 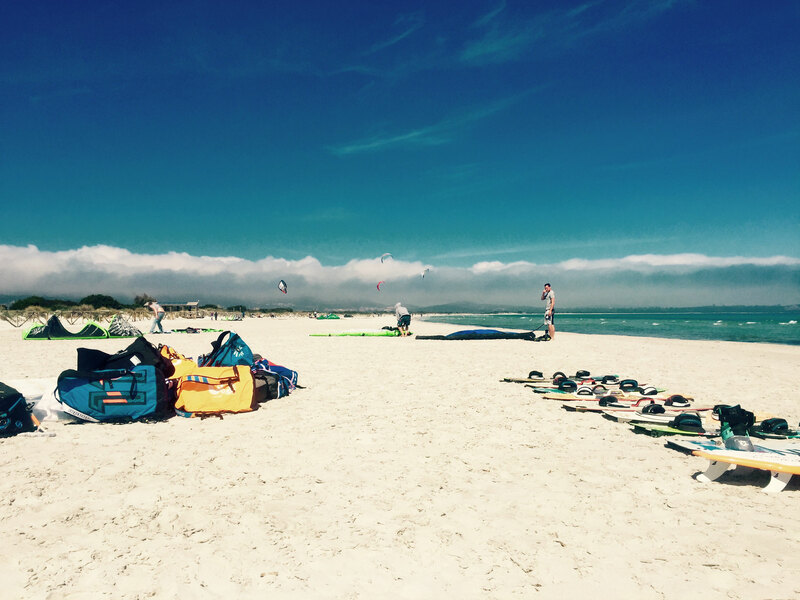 During this period the participants will carry out practical and theoretical lessons from morning to evening, where they will be able to live and learn about the true world of windsurfing. At sea and on land, they will always find the right atmosphere, from the technical planning of the day up to the moments to be shared together in front of a typical dinner or an aperitif outdoors. Aimed at those who already have a good command of the equipment. The "funboard" world with the glide emotions. The wind to be tackled will be medium / strong and this will allow us to perfect the basic maneuvers. The highlight will be the search for the right trim, glide and the right body position in fast pace. The discipline of the future could not be lacking! 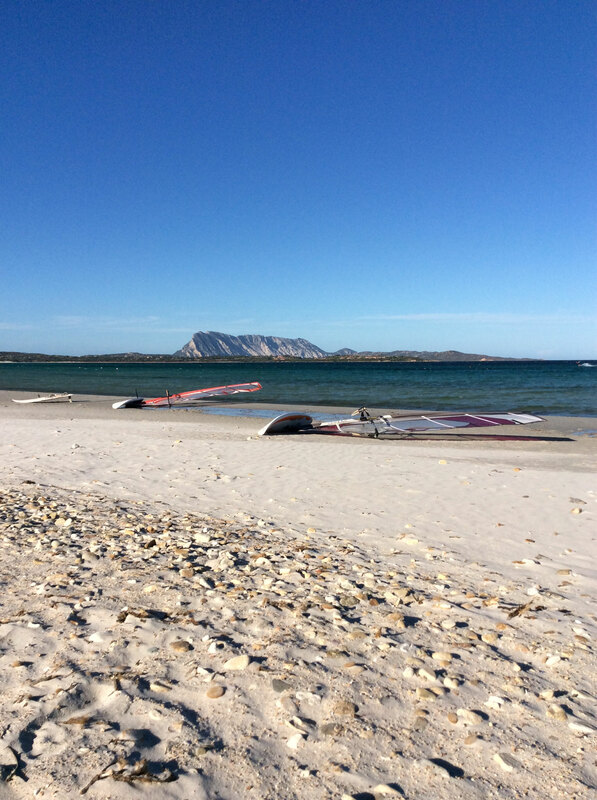 San Teodoro thanks to its thermal from the south-east constant and always around 8/10 knots, makes this spot perfect for practicing this new way to go by sea. 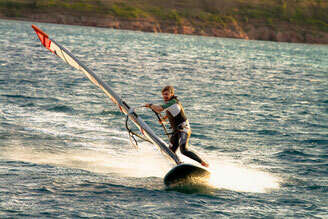 From this year in fact, anyone, can experience the thrill and emotions that offers discipline of foiling! The all-inclusive formula consists of an experience in which the package includes food, lodging, course, material, insurance and the transfer to and from the port / airport. This offer is aimed at those who have their own equipment but intend to participate in our clinics to take advantage of the advice or simply train alongside the professionals of our sport, sharing all the fun together with others. For those who want to join the clinc only, therefore feeling more free and independent in the choice of accommodation and meals, we have also thought of them, preparing the right offer! In all the packages offered, the participants will have our instructors at their disposal, who, like true personal coaches, will follow you throughout the day imparting practical and theoretical knowledge, thus experiencing a full immersion experience by acquiring techniques and knowledge directly from the experience of great champions. The days will be developed and organized according to the weather and wind conditions. Thanks to the favorable position of Sardinia, based on the direction and intensity of the wind, in order to always carry out the day positively, it is foreseen that it is possible to organize transfers to other spots, in the North or West of the island. last but not least, once the day is over, we will share the experiences we have all together, sitting around a table, tasting the delights that only Italian cuisine can offer and that are one of the flagships of our famous camp !! 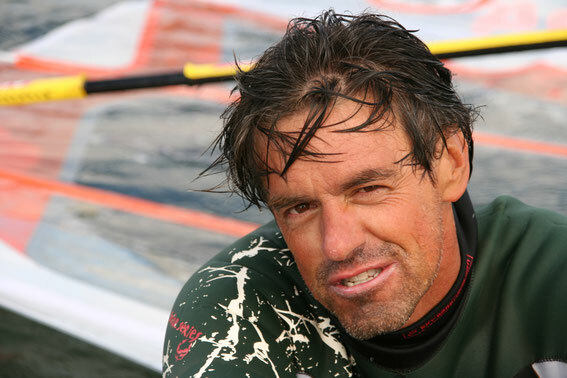 Ross Williams born 39 years ago on the Isle of Wight been windsurfing since i was 5 years old. and i started to compete on the world tour when i was 17. Over the years i have competed inside the PWA top 10 rankings in Wave, formula, slalom, super x. I have won world and European titles in formula racing. 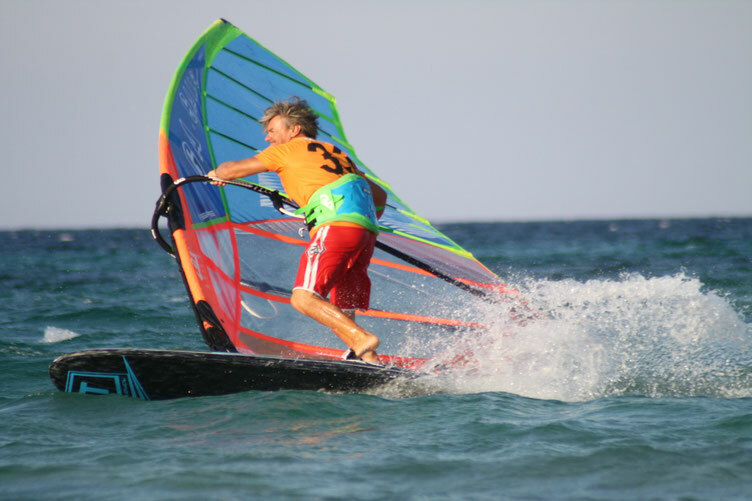 I have finished top 3 in the PWA world tour rankings in slalom. Current in 2018 i finished 6th, which was a bit disappointing, but I’m working hard to be better again for 2019 tour. Eugenio Patrone, known by all as "Enio" began his career as a "water man" in these waters. 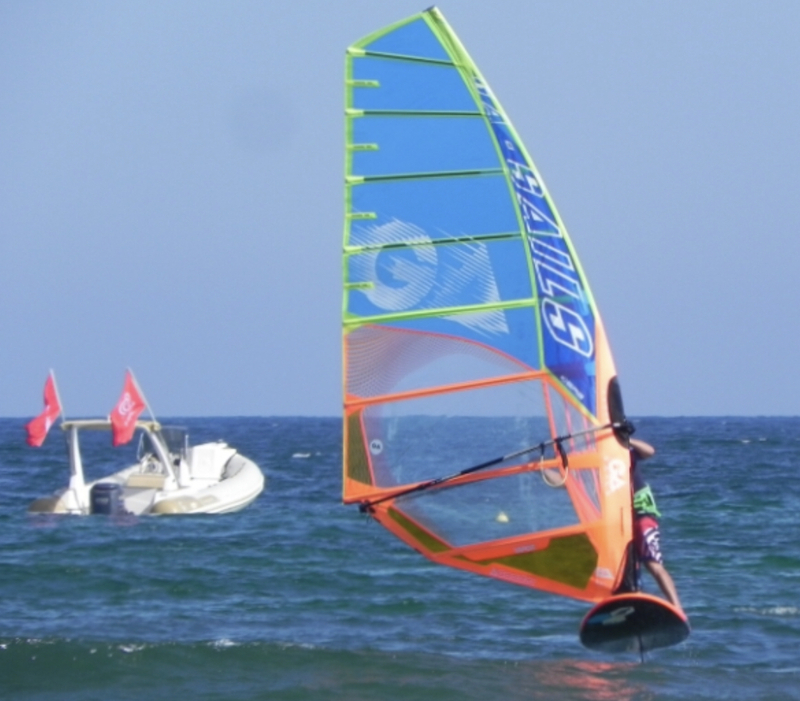 Great passionate and practicing water sports is from here, which in 1985 began to appear in the windsurfing world. 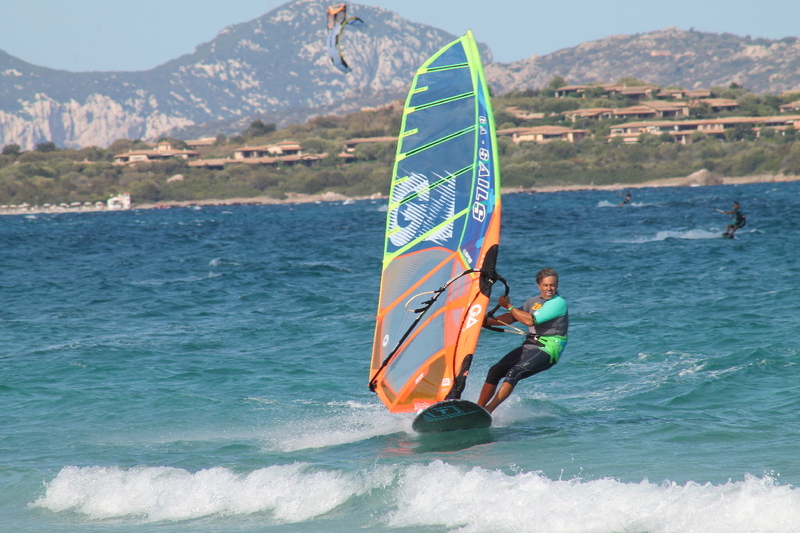 From Voltri then to Tarifa, France, the Canary Islands, the Caribbean Islands, Hawaii, Africa, until arriving in Sardinia, where for the last 15 years it has spread the sport to young and old, passionate or simply curious to experience the sensation of slipping. Federal Instructor (FIV) VDWS instructor, allow him and his team to ensure a high standard of teaching and safety with a result on students appreciated and guaranteed! For any questions about and booking of the low season camps write us an email and we will provide you with more informations!